1) To capture the entire view of the monitor screen, press the "Print Screen" key. To capture only the active window, hold the "Alt" key and press "Print Screen". Either method will copy the image to the Windows internal clipboard. Alternatively, users of Vista and Windows 7 can use the Snipping Tool instead of the above. Note: Vista Home Basic and Windows 7 Starter do not include the Snipping Tool. 2) Open MS Paint or another imaging program, e.g. Adobe Photoshop Elements. In Paint, click "Edit" and then "Paste". 3) Save the image to your desktop as a jpeg or png file. 5) After clicking on the tree icon, the window below will appear. To upload the image from your computer to your message (the image will also be automatically uploaded to your image gallery), make sure the "My Computer" tab is selected and click on "Browse". You can also adjust the image size and alignment. Once the image has been uploaded, click on "Insert Image". The image will appear in your message and image gallery. If you want to upload an image in advance, then you can go to your image gallery by clicking on your user name, scrolling to the bottom of your profile page and clicking on "View Image Gallery". You will be given the option to upload images to your gallery. 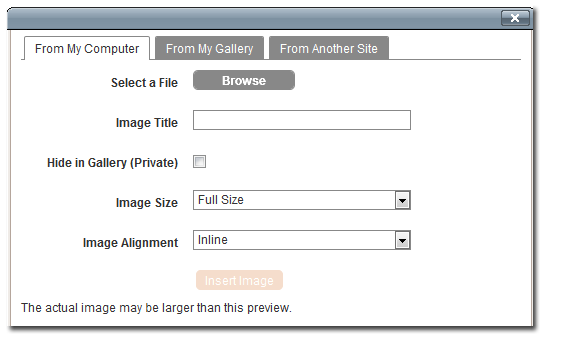 When composing a message, you can then select "From My Gallery" (see image above) to upload the image. Note: Your images will be reviewed for content by a moderator before they are publicly visible, so don't be surprised if you see an image placeholder (yellow triangle) in your post pending image approval.